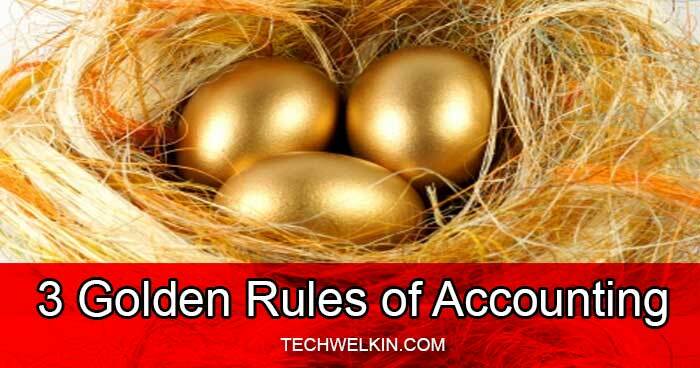 Learn the three golden rules of accounting with examples. These rules are often asked in job interviews as they make the double entry system of debit and credit much simpler to remember. Long time ago, I told an uncle of mine that I could never remember this debit credit stuff in accounting. He said that it’s good that you’re not an accountant and don’t have to face a job interview. Otherwise you would have failed miserably! Then he told me about the three golden rules of accounting. He said that even accounts people use these rules to remember accounting basics during job interview questions. The good uncle enlightened me that the double entry system of accounting uses a set of principals involving debits and credits. This morning I was going through an accounts statement and it reminded me of the golden rules of accounting once again. I also realized that it’s been long since I have written something about non-tech daily life. So, today I will explain these accounting principals. Every professional blogger should know and use these principals if they are required to keep books. This principal applies to the personal accounts. Every business deals with a number of people. Personal accounts are maintained for such persons. If a person gives something to the business (e.g. a loan) she is called giver and if a person receives something from business (e.g. salary) she is called receiver. The first golden rule of accounting tells the accountant to debit the receiver’s personal account and credit the giver’s personal account. The second rule applies to the real accounts. Unlike personal accounts, the real accounts pertain to property of the business. Properties may includes land, office building, furniture and all other real assets of the business. The rule commands the accountant to debit the account of the property that comes into the business. For example, if a business purchase a new office building , the account of that office will be debited. If a property goes away from the business, the account of that property should be credited. For example, if a business sold some office furniture, the furniture account will be credited. Third rule applies to the nominal accounts. These are the accounts that deal with the expense/income and profit/loss of the business. This golden rule of accounting says that accounts of all the expenses (for example, payment for advertising campaigns) and losses should be debited. On the contrary, accounts of all the income (e.g. amount collected from goods sold) and profits should be credited. These three rules are simple enough. If you’re involved in book-keeping and if you are following the double entry system, you should never forget these rules. If you would understand the types of accounts and will unfailingly apply appropriate rule to various accounts, you will never face a problem. In double entry system, it’s all about balance in two sides. These golden rules ensure that the balance is maintained. Should you have any suggestions or question related with this topic, please feel free to use the comments area. Thank you for using TechWelkin! My question is what is the logic behind nominal rule account.